I flew into Fresno as usual and took the bus up to Lodgepole. I spent the night in a campground nearby, and picked up my wilderness permit first thing. A friendly couple gave me a ride to Wolverton, saving me a couple miles of hiking. I saw dozens of people on my trip up to Pear Lake, all of them coming out. Several warned me of the rain. I was glad that I would have the backcountry all to myself, and assured myself that I had adequate rain gear. I made it to Pear Lake by lunch time, and then kept on going, reaching a point about half way between Pear Lake and Moose Lake.before stopping. Mostly I saw thick clouds rather than rain. I was pleased to see the day begin with clear skies. There was no one at Moose Lake, at least not visible to me. Skirting Moose Lake, I headed towards the higher reaches of the Tablelands. This small, unnamed lake, is one of my favorite places. Whenever I can, I visit or stay the night here. It is about as near the top of the world as I can imagine. 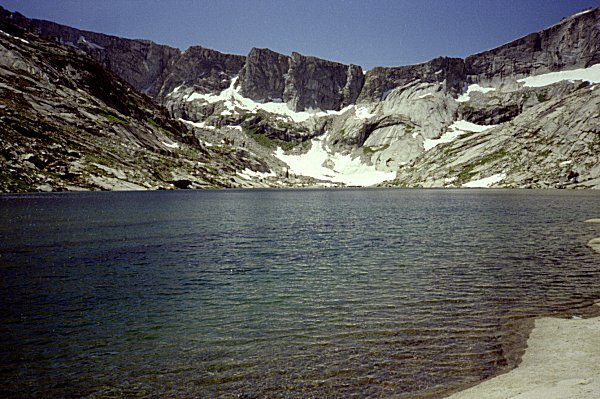 On the one side, about ten feet from the edge of the lake, is a giant cliff leading a thousand feet or more down to Big Bird Lake. On the other side is the gradual slope of the Tablelands, with visibility all the way into the Central Valley on a clear day. I even have a regular camping spot by this lake. It in a crack between the rocks, with handy knobs to which I can tie my tent fly or my poncho. I put the fly up not because of the rain, but to provide some shelter from the sun. This is the view to the east from my camp spot. Big Bird Lake is to the left of these smaller, higher, lakes. Elizabeth Pass is beyond, behind the clouds. The clouds were blowing over the ridge, then dissipating as they passed into Deadman Canyon. I spent a good part of the afternoon just watching the clouds come up and over, and the disappear. The next day, I descended to Big Bird Lake. From previous experience, I had learned how not to do this. The route I chose this time, descending the slope immediately west of Big Bird Lake, was much safer and more enjoyable. I had intended to go farther, but as I reached the lake the wind suddenly came up and rain threatened. I had a difficult time getting my tent set up in the wind, and in doing so I broke a critical plastic part, the one joining my two poles into a "V". Luckily I had foreseen this difficulty, and had brought a spare part (just about the only spare anything I carry). The next day I descended Deadman Canyon. A mile or two before the trail reaches Roaring River it starts descending more steeply than before, and approaches the creek. This is another one of my favorite camp spots. There is a little ridge separating the creek from the trail, so my camp spot is not visible to those passing by. I enjoyed the pleasant sounds of the river all night. I descended the rest of the way down Deadman Canyon, crossed Roaring River, and climbed back up Cloud Canyon. The weather was wonderful, the scenery memorable. Everything was so green. Although I had been on trails since Big Bird Lake, I had seen no one since leaving there. I continued up the trail to Colby Lake. Although the water was freezing cold, I waded into the water and rinsed the dust off my lower legs and arms. I could not bear to get all the way in. 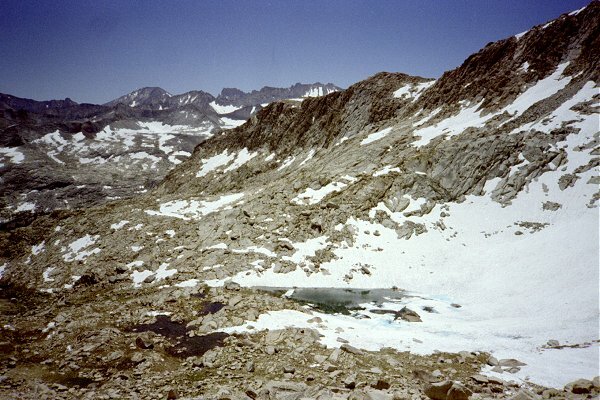 This shows Colby Lake with Colby Pass beyond. Small patches of snow covered the trail in a few spots, but it was not a problem going around them. The detours away from the trail necessitated by the snow led me to discover these bones. I photographed them beside my pack, to give some sense of scale. The one on top could have been a thigh bone -- it was about the right size. But the one at the bottom did not seem to match anything in a human. I suppose they were from a pack animal that came to its end on the steep portion of the trail above. 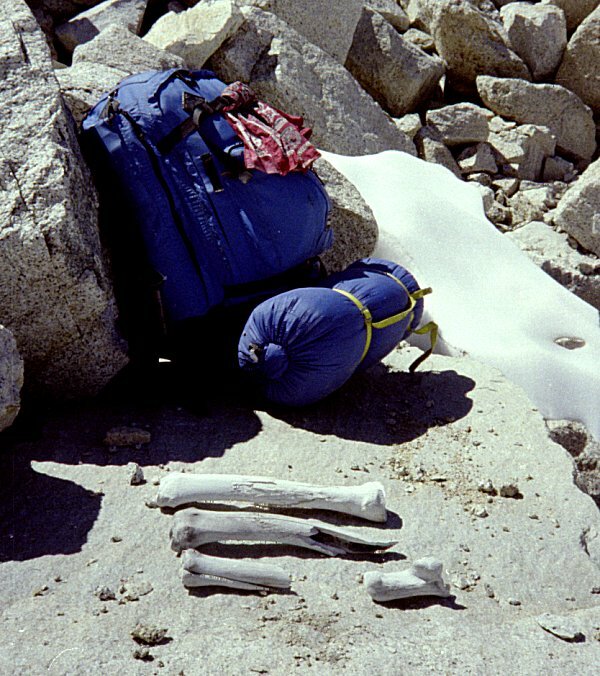 Knowing that they are there, I have managed to spot these bones in the years since, each time I have passed through Colby Pass. People must be good citizens, leaving things where they found them (or are not very observant). Once I crossed Colby Pass, I felt like I was in much less familiar territory. 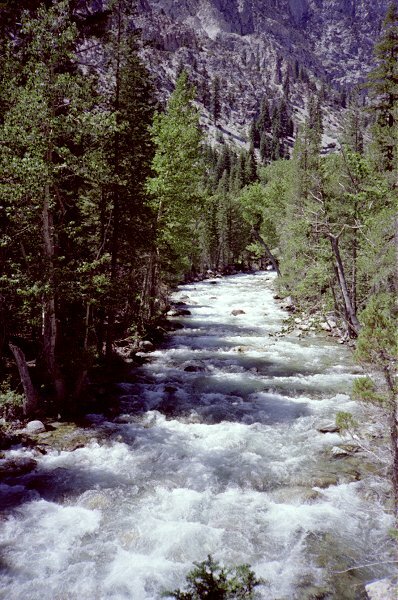 I had been up and down Cloud and Deadman Canyons many times, but had only been in the Kern-Kaweah watershed once, as a boy. I wanted to spend a couple of days in this high, remote valley, exploring its many lakes. 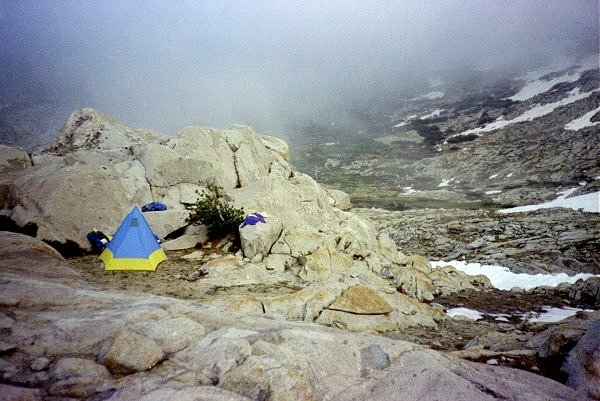 Just below Colby Pass in the upper Kern-Kaweah basin I stopped for rest. I love this tent because I can set the fly up separately, to get out of the direct sun. The gap below lets the breeze through, and allows me to get in and out and to see a little of what is going on. I took a nap by this lake, then packed up and moved on down the canyon. 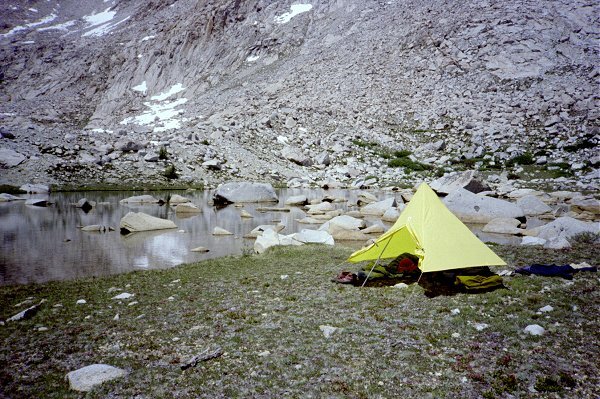 I camped for the night near a little lake about half a mile off the trail, perched on a little flat spot part way up the side of the valley. 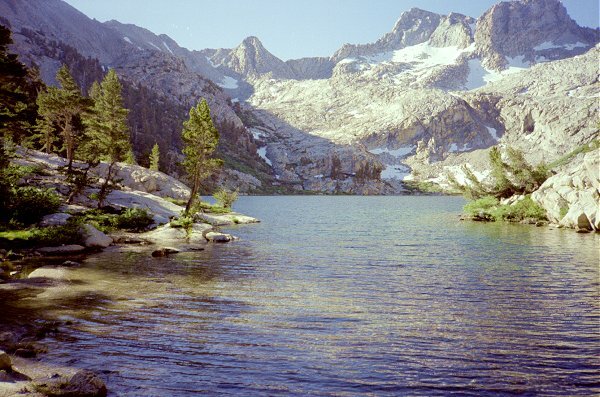 The next day I spent exploring the north side of the Kern-Kaweah basin. To the south lie the frightening peaks of the Kaweahs. 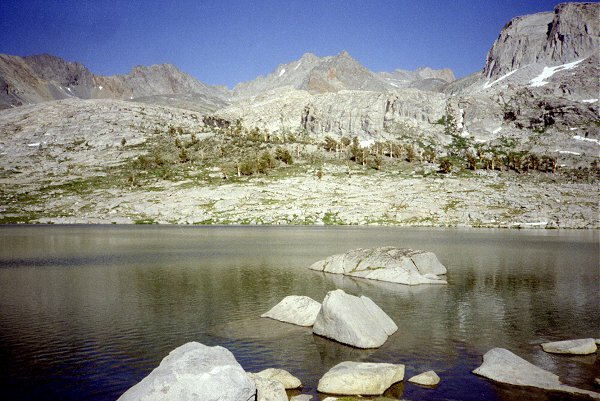 These are black and red, in contrast to most parts of the Sierras, which are lighter granite. I climbed up to a gap in Kern Ridge, and looked over. 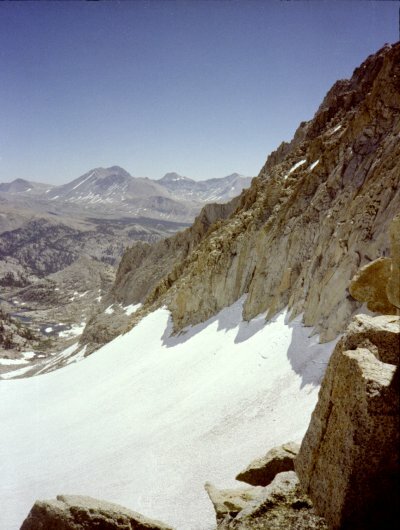 The other side was sheer cliffs, with snow fields at their foot. Not all parts of the upper basin were so austere. There are wooded slopes, lakes, and meadows all around. I was especially interested in examining Pants Pass, shown here. I believe it is not the low spot on the horizon, the one with the snow chute below, but the next lower spot to its left. 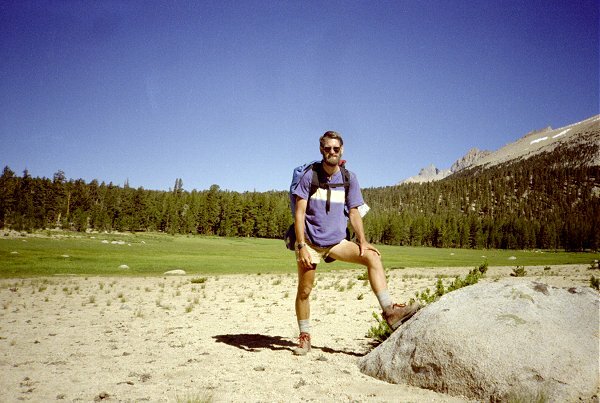 As a boy I hiked across the Sierras from Whitney Portal to Lodgepole, through Pants Pass. I remember that as being a thrilling experience, and I can now see why. I was contemplating taking the same route on this trip, but changed my mind when I saw how steep it was. I moved my campsite to the south side of the basin, near another picturesque lake. This side of the basin is much closer to the Kaweahs, and is composed of the black and red rocks that make it up. Unlike granite, these rocks break into many sharp pieces rather than just weather away. When two of them hit each other they seem to ring rather than thud. I spent the second day exploring the many lakes and basins on the this side of the basin. 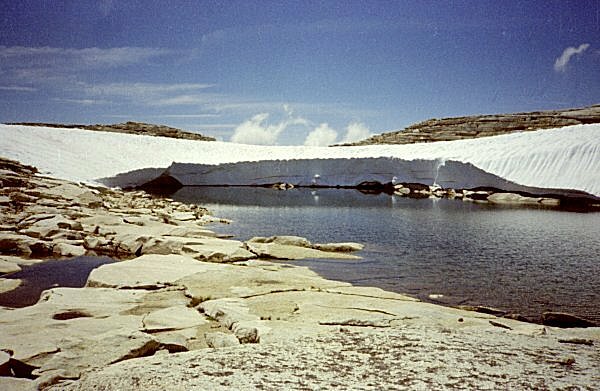 There were fewer trees and meadows, and more rock-enclosed lakes and much more snow. Leaving the next morning, I twisted my ankle on the loose rock. for a few minutes, I was worried whether or not I could go on. But after a while the pain subsided, and I was able to walk gingerly on it. 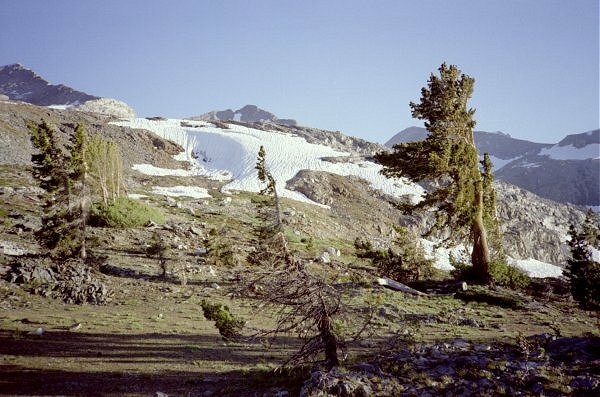 I just kept on going, at first hoping to get to a trail, then to get to the Kern River and the John Muir trail where I would be sure to see people. When I was there, I realized that it was not going to get worse, so I continued down to the hot springs. 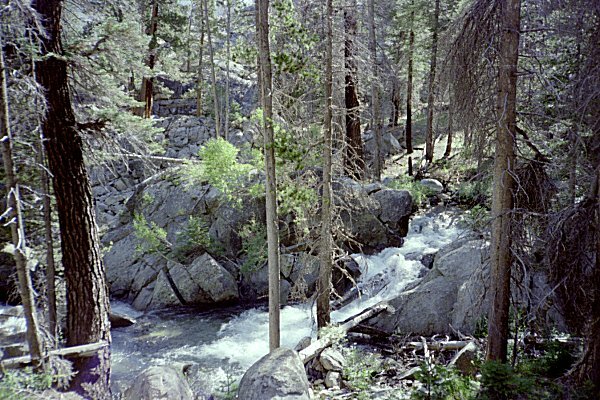 The Kern River forms a deep canyon, stretching north and south in the southern Sierra. the steep walls remind me of the Kings River or of Paradise Valley. 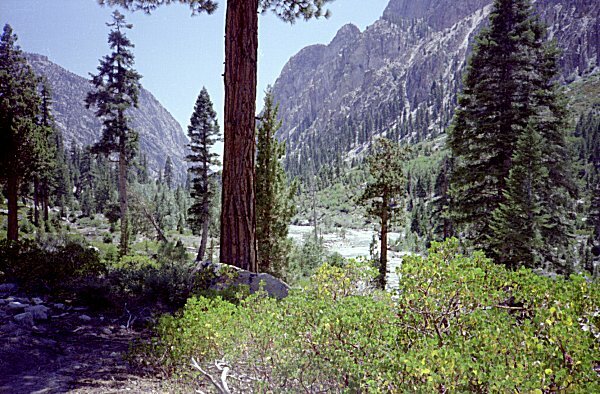 This view of the valley is looking south from the confluence of the Kern and the Kaweah. There are no bridges across the Kern, and the crossing of it had been on my mind for several days. As a boy I had crossed it with my father, something I remember him worrying about. It turned out not to be a big deal. But since then, I had had a bad experience with rushing water, and I was worried. I took off my boots, put on sandals, and waded across without incident. This picture shows what the crossing was like. I had a refreshing soak in the hot spring. It is pretty rustic: a concrete basin about the size of a bathtub, with a pipe on the high end and another pipe on the low end. Both are normally plugged up with sticks. If you pull out the stick on the high end, water pours into the tub: water that is much too hot to soak in; water that smell strongly of sulfur. There is a canvas bucket alongside the tub. It takes about two bucketfulls of cold water from the Kern River about 30 feet away to cool the water enough to allow me to get in. I don't actually feel cleaner -- the sulfur laden water leaves a slimy scum all over me, but I feel relaxed and refreshed. I could wash off in the river, but I don't want that. I would rather just stay slimy than plunge into freezing water. 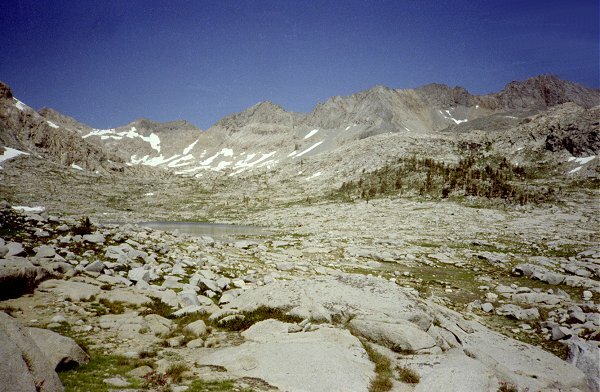 The next day, I had to ascend out of Kern Canyon. I allocated the whole day just to climb out of the deep well of the canyon. I was thinking that I could get to the Chagoopa Plateau by lunchtime, and could explore some of the lakes and meadows up there. I honestly don't know where the day went. I know I started early, hitting the trail long before the sun was visible on the canyon walls above me. And I stopped for the night as the sun was setting, having just reached the Chagoopa Plateau. I don't remember anything in between, except for walking. There aren't any pictures either. 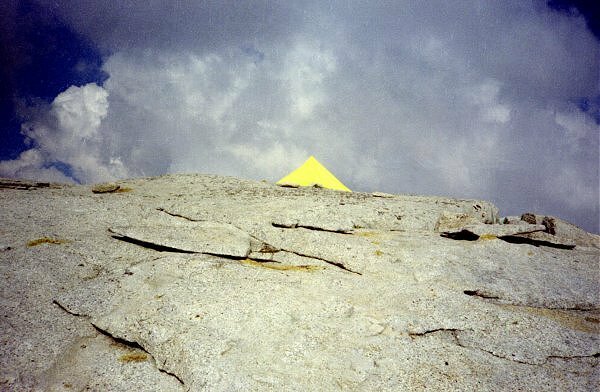 The next day I crossed the Chagoopa Plateau, stopping to admire Mt. 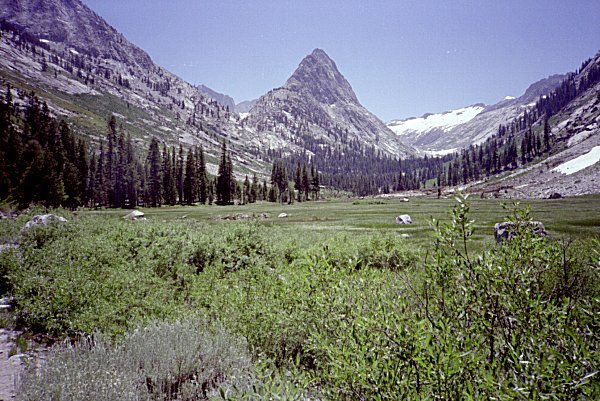 Kaweah from the south. From this direction the peak looks gentle and easy to climb. I made a mental note to come back this way with time to explore this area more thoroughly. I hiked up Big Arroyo, enjoying the nearly-level walking. At Nine Lakes Basin I stopped and explored for the rest of the afternoon. This picture shows Pants Pass from the west. Again, the lowest point on the horizon is not the pass: again it has a snow chute beneath it. The pass is the next low spot to the right. 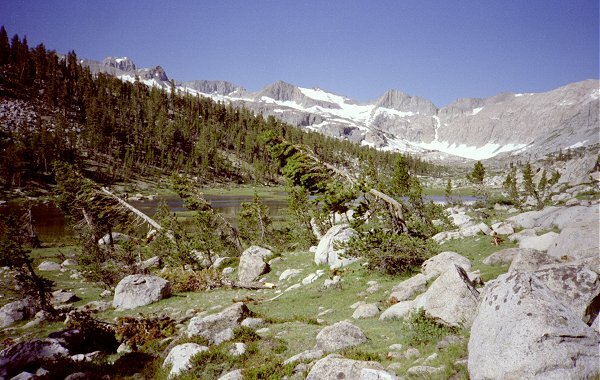 Note how the lower elevations on the ridge are lighter, granite rock, whereas the higher reaches are dark. 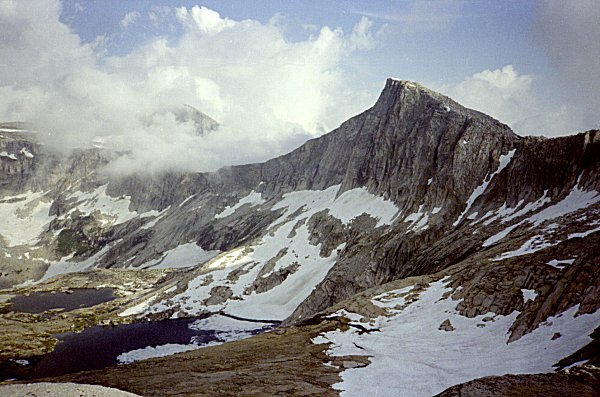 The dark rock that predominates in the Kaweah Peaks is more and more prevalent as one moves east (right in this picture). 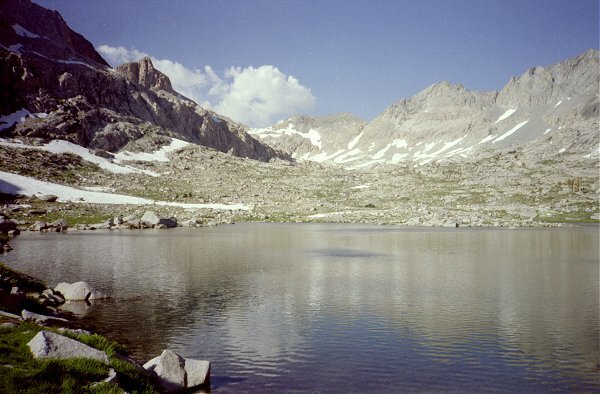 Here is another view of Nine Lakes Basin, with Pants Pass on the skyline. I explored around the basin, and have never been able to figure out how there were nine lakes. 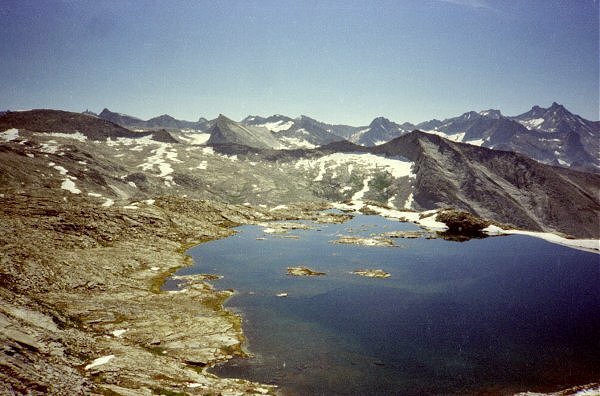 There are fewer big lakes, and if you want to get into counting tiny lakes and tarns, it would come to many more. On the last night, with only one day's food left, I put my food and trash on a big rock, with my cookware on top. About 1:00 AM I heard the cookpots being knocked over. On investigation, I found that animal had been investigating. I set the food up again, and went back to bed. A little while later, I heard the pots again. This time, I managed to spot a bear -- a cub. I tried chasing it away, but it seemed to be hanging around. Finally I gathered all my food together, set it before me, and sat up in my sleeping bag. I stayed up the whole rest of the night, watching the stars slowly rotate around the sky. It was fascinating to watch each star disappear beneath the horizon, and to watch new ones pop up. Finally the sky began to lighten, almost imperceptibly at first. I was so glad to see the sun.